The Solberg family believes in the importance of clean water. Charles and Joyce, along with their five children, Jenny, Chad, Travis, Lisa, and Sarah, see clean water as a guiding value personally and for the family business, Solberg Manufacturing. “Quite simply, there really is nothing more important than clean drinking water,” said Joyce. Joyce was the first Solberg family member to connect to the Alliance for the Great Lakes, learning about the organization nine years ago. She immediately wanted to get involved, explaining, “I believe in clean water. I love the lakes. And after raising 5 children, I finally had time to get involved with something I cared about.” Joyce has been an active volunteer, serving as a member of the Alliance’s Board of Directors for 6 years and as a Great Blue Benefit committee member. Today, supporting the Alliance for the Great Lakes is a family endeavor. 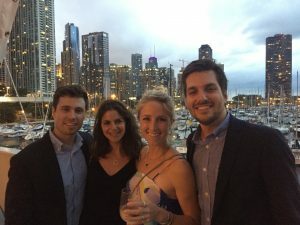 Jenny Solberg Katzman with husband Taylor Katzman (right) with friends (left) at the Great Blue Benefit in 2017. It’s hard not to form a deep appreciation for the Great Lakes if you live on or visit their shores. For the Solberg family, those special memories were made on Lake Michigan, which they call home. “We believe that keeping the Great Lakes clean is one of the most important environmental things to support… our family grew up swimming in Lake Michigan,” said Joyce. 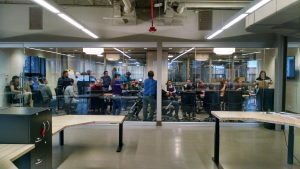 “We try to follow through on our support for the Alliance in any way that we can. We believe in their work,” noted Joyce. 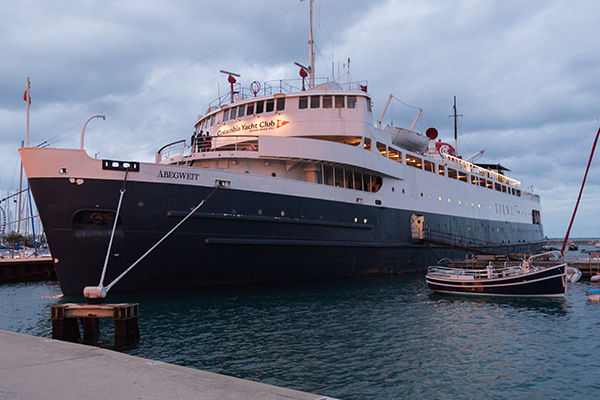 Connecting the Alliance with their business is one way they’ve extended their love for the Great Lakes beyond individual support. Solberg Manufacturing is a certified B Corp, meeting rigorous standards of social and environmental performance, accountability, and transparency. “One of Solberg’s core principles is ‘We love our planet’. The environment has been a very important part of our giving as 50% of our total philanthropic giving is to the environment and an important part of that is local,” noted Joyce. Solberg Manufacturing Inc. Conference room. In addition to taking action to ensure business practices are environmentally sustainable, Solberg Manufacturing has donated $285,000 to the Alliance for the Great Lakes over the past eight years. The company has generously supported the work of the Alliance through general corporate support, and has been the lead sponsor of the Great Blue Benefit for the past four years, having a powerful impact on the Alliance’s ability to protect the Great Lakes. Jenny, Travis, Sarah, Lisa, and Chad Solberg. Support of the Alliance for the Great Lakes has evolved into a full family affair over the years. Jenny’s business, Rhine Hall Distillery, has supported the Alliance in numerous ways, from donating Great Blue Benefit auction packages and serving as a beverage sponsor of the event, to hosting Alliance events at the distillery. Lisa, Sarah and Travis Solberg have each contributed to the Alliance, and Chad Solberg served as a member of the Alliance’s Young Professional Council in Chicago. Travis volunteers as an Alliance Ambassador and as an Adopt-a-Beach team leader, and recently joined the Alliance’s Climate Ride team. Sarah, Travis, and Chad are all part of the family business. 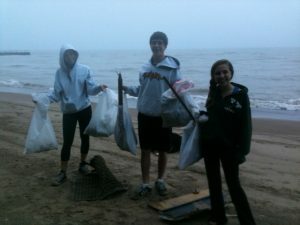 Three of Tor Solberg’s five children cleaning up Maple St. Beach in Winnetka, Illinois. Tor Solberg, President of Solberg Manufacturing, frequently cleans up Maple St. Beach in Winnetka, Illinois with his children Liza, Gunnar, Matt, Mia, and Tommy. Thank you to Solberg Manufacturing, Inc. and the Solberg family for your ongoing support and for your commitment to clean water. You can join the Solberg family to make the Great Blue Benefit on June 21st the best yet by becoming a sponsor or attending the event! By sponsoring the Great Blue Benefit, you'll advance the Alliance's programs that keep our beaches and coastlines clean and healthy, protect our drinking water, and teach children about this global treasure and our responsibility to protect it.